Auckland Radio ZLD closed at 19h00 on 30 September 1993, after almost 81 years of service. At the same time, sister station Wellington Radio ZLW also closed. 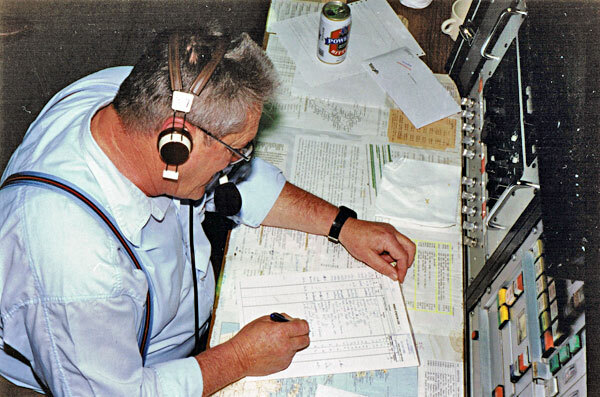 Auckland Radio ZLD supervisor Chuck McLeod makes the final radiotelephone transmission from the station on 30 September 1993. The can of beer was not customary, claims the photographer, former ZLD tech Paul Chamberlain. Chuck had been a radio operator since Feb 1960 and previously worked at ZLW. Here is the final radiotelephone transmission from ZLD. The operator is Chuck McLeod. Hello all stations, all stations, all stations. This is Auckland Radio, Auckland Radio, Auckland Radio, Zulu Lima Delta. Good evening all. As a SOLAS station, Auckland Radio is now ceasing responsibility. All further communications will be handled by Taupo Maritime Radio Zulu Lima Mike. We wish all our customers in the past all the best for the future. Auckland Radio out, and listening 2182, 4125, 6215, VHF Channel 16. Over. Zulu Lima Delta, Zula Lima Delta, Melbourne Radio, Melbourne Radio. Do you copy? 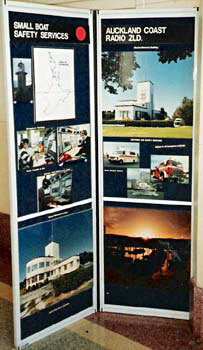 This is Taupo Maritime Radio Zulu Lima [unclear]. You’re Strength 3 and clear. Strength 3 and clear, Roger, OK. Your modulation is very thin and very, very weak. I’m finding a lot of difficulty actually understanding what you’re saying. Over. This is Taupo Maritime Radio. Thanks very much, we’re working on that problem at the moment. OK, thanks very much. Bye. Hello all station, all stations, all stations. This is Auckland Radio, Auckland Radio, Auckland Radio ZLD. Good evening. 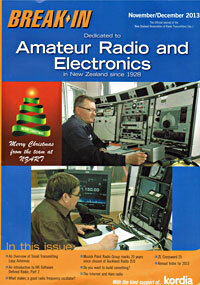 After 81 years in the radiotelephony services, Auckland Radio ZLD will now cease transmission. On behalf of all the staff at ZLD, our best best wishes to you all. To see us out, I’d like to play a little ditty called ‘Anchors Away’. [music] That’s all folks. Good night. Auckland, Sydney Radio. All the very best. Over. Roger Sydney. Thank you very much indeed. Auckland Coast Guard Radio, this is Auckland Radio. Roger, go ahead. Roger, roger, thank you very much indeed. Thank you. Roger. Roger, thank you very much indeed. Good luck and good night. This is Union Rotoma, Union Rotoma. Our best wishes and good luck. Over and out. Union Rotoma, this is Auckland Radio ZLD. Roger Union Rotoma, thank you very much and good night. Northern [unclear], this is Auckland Radio. Good Evening. Go ahead. Northern [unclear], this is Auckland Radio. Roger, thank you very much indeed. Over. ZLD Auckland Radio from [unclear]. Do you copy? Over. [unclear], this is Auckland Radio. Good evening. Go ahead. Sea Tow towing services, this is Auckland Radio. Roger Sea Tow, thank you very much indeed. ZLD closing certificate issued to radio operator Tony Graham. Click for full-size image. 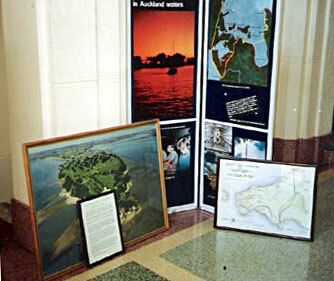 Documents, pictures and other memorabilia were collected by the National Archives, Auckland office. 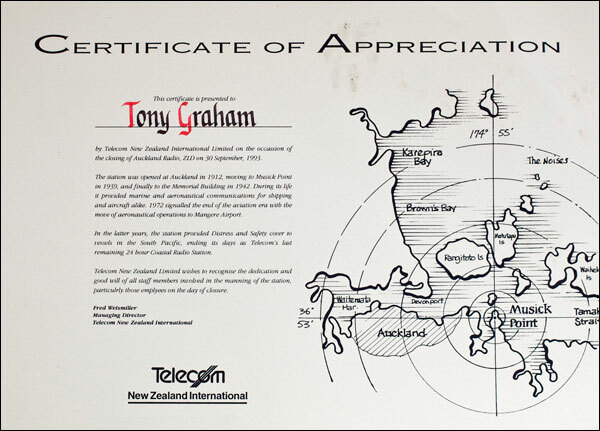 The same had been done at each of the other Coast Radio Stations, ZLW Wellington, ZLB Awarua and ZLC Chatham Islands.